The graduating class of military veterans received professional certification for mastering various dog training tools and techniques and for working with dogs at an animal rescue and advocacy organization in Los Angeles. 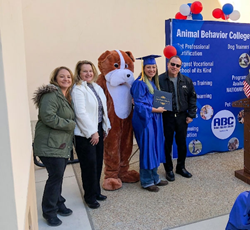 Animal Behavior College (ABC), a vocational school that trains professional dog and cat trainers, veterinary assistants and pet groomers, held its ninth Dog Trainer In-Classroom Program commencement ceremony on Friday, February 23, 2018. The pomp and circumstance took place at the school’s headquarters located at 25104 Rye Canyon Loop in Santa Clarita, California. The graduating class of military veterans received professional certification for mastering various dog training tools and techniques, and using effective problem-solving and positive reinforcement to handle canine behaviors; they also learned pet first aid and CPR. In addition, to their classroom studies, the graduates gained valuable hands-on experience by working with dogs at an animal rescue and advocacy organization in Los Angeles. The course is taught by Beth Harrison, a seasoned ABC Certified Professional Dog Trainer-Level 2 (ABCDT-Level 2, which is the school’s highest certification level). Dog trainers who achieve Level 2 status have demonstrated professional prowess and a mastery of canine behavior and learning theory. Debbie Kendrick, vice president of operations for ABC, also praised the graduates’ accomplishments. She then joined Mr. Appelbaum and Candace Mason, ABC’s director of admission, in presenting award certificates to John Butler, Taylor Green, Jennifer Roedl, Ryan Wan and Thania Tovar. Ms. Tovar always felt a connection with animals. After being honorably discharged from the U.S. Army and then working as a cashier, she felt dissatisfied with her career path and enrolled in pet grooming school. Following graduation, she opened a grooming salon in San Fernando, California. While grooming dogs, she soon realized the need to learn more about her canine clients and enrolled in the program. For ABC dog-training graduates and other animal care and service workers, the jobs forecast in the U.S. appear promising. The U.S. Bureau of Labor Statistics predicts employment will grow 23 percent from 2010 to 2020, faster than the average for all occupations. With 60.2 million U.S. households owning a dog, which equates to 89.7 million dogs, according to the 2017-2018 American Pet Product National Pet Owners Survey, ABC certified dog trainers have the option of working for an established company or building their own successful dog training business. ABC offers the 5-month immersive learning in-classroom course for students who prefer a traditional classroom setting and face-to-face instruction with an instructor instead of an online program. The course is offered twice a year in February or March (Spring Class) and in August or September (Fall Class), is open to all military veterans, their spouses or dependent children. Enrollment is also open to students with no military affiliation or experience who prefer a classroom environment as opposed to an online course. ABC is currently enrolling students and the next class will begin March 19, 2018. As of February 23, 2018, 158 U.S. veterans and more than 3,700 military spouses and other dependents have enrolled and graduated from three of ABC’s four core programs — the Dog Obedience Program, the Grooming Instruction Program, and the Veterinary Assistant Program. ABC also offers certification through the Cat Training Program and specialized certificates of completion in [five Short-Term Programs on subjects including pet massage, pet nutrition, pet sitting, training shelter dogs, and selling and teaching private lessons. Individuals with no military experience or affiliation may qualify for a variety of finance programs ABC offers. Military veterans may qualify for financial assistance. To learn more, call 800-795-3294 or visit ABC’s website at https://www.animalbehaviorcollege.com/gi-bill-approved-dog-trainer-program/. Now celebrating its 20th Anniversary, Animal Behavior College is a vocational college that trains professional dog trainers, cat trainers, veterinary assistants and pet groomers nationwide and in the 10 provinces of Canada. As of January 31, 2018, ABC has graduated more than 25,000 students from all of its four core programs combined. Students obtain practical, hands-on experience applying what they learn by working side-by-side with a member of ABC's expert mentors’ group. These professional mentors include thousands of professional dog trainers, veterinary hospitals and grooming salons from all across the U.S. and Canada who are dedicated to helping students to succeed in the pet services industry.